This poster presentation was presented in Excellence 2005 seminar recently by Dr.T.Semparuthi, Madurai. 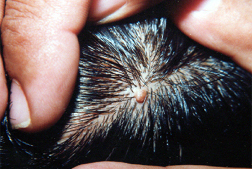 I am presenting a case of Naevus Scalp. 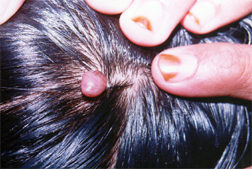 A young boy with fair complexion, presented with swelling over the scalp This was present for many years. Now grown to present size. So, the patient was complaining of pain since few months and swelling was gradually increasing in size. There was history of asthmatic bronchitis in childhood. In such a case we need to understand the basic pathology of naevus. Naevus is nothing but a benign tumor. 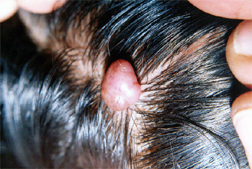 It may be congenital or acquired which can probe larger. If it is present elsewhere it can turn out to be a malignant one. So, it has a relevance in our prescription. 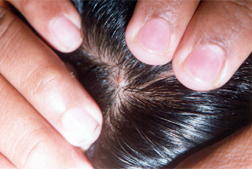 So the main thing which was considered for prescription was the miasmatic background, The fundamental and dominant miasm .So considering the growth this is a typical sycotic background and the naevus scalp never turn out to be a malignant one. Usually it is a benign one. And the other thing considered was History of asthmatic bronchitis in childhood, which used to be <rainy weather and winter. There was a family history also. Mother had asthma and now gone into corpulmonale Asthma can be taken into psoric prescribing So, in psoric stage <emotional factors . In sycotic stage < damp weather and in tubercular and syphilitic stage it would be going to corpulmonale and status asthmaticus. So, this is a very relevantinformation gathered from patients which miasm the patient is in. So, this case was dominantly sycotic miasm. So, the prescription considered was Hahnemann’s greatest anti-sycotic remedy and first proved by Hahnemann. There was no earlier proving and evidences about this remedy. So Thuja was given 0/1 once in three days. This was continued for I month In next month changed to 0/2 once in 3 days.Please note the slides with photo graphs shown in the Visual Corner here after 15,30 and 45 days treatment.So, basically it was considered on sycotic aspects. Constitutional aspects are not considered This is a simple case.